SeeClickFix is excited to be participating in its first of two events at Social Media Week in NYC today. Join Patch and our friends at WNYC, NBC and SeeClickFix for a discussion with brands that have used social media to quickly go into neighborhoods and solve problems big and small, provoke action and affect positive change. This one will rank as a SeeClickFix first. We know of at least four reports from pregnant women who documented that they were concerned about lack of access to hospitals during this past blizzard, Nemo. This is the only case that we know of where the woman was actually in labor, got her street plowed as a result of SeeClickFix, and delivered her baby six hours labor. 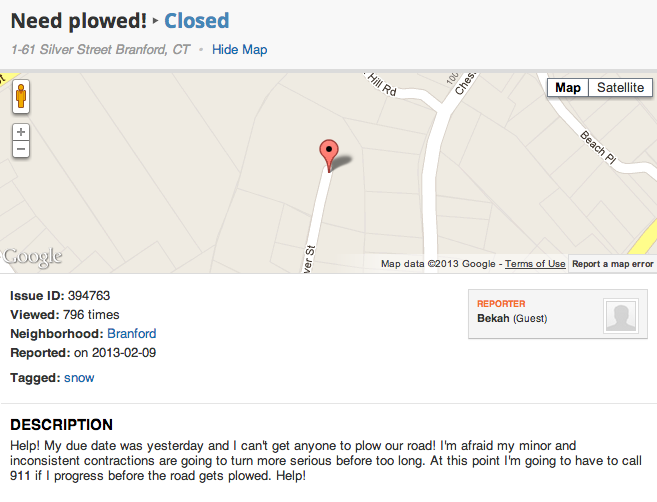 Bekah in Branford CT, posted on the evening of February 9th: "Help! My due date was yesterday and I can't get anyone to plow our road! I'm afraid my minor and inconsistent contractions are going to turn more serious before too long. At this point I'm going to have to call 911 if I progress before the road gets plowed. Help!" After we alerted Bekah that she should certainly alert 911 if she felt in danger, another individual, Kate, chimed in to say that she had posted the report to other social media sites and had contacted Branford's Town Hall and others to spread the word. I can hear the plow! Thank you thank you thank you!!!" 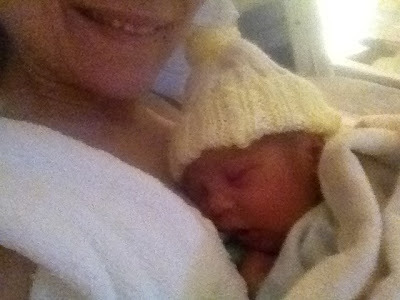 And six hours later, the baby arrived. "A million gratitudes over again! I can't even put into words the immense gratitude I have for the crew who plowed Silver St in Branford. A very happy and healthy baby boy! 6 lbs 6 oz 19 in long. Born less than 6 hours of true contractions!" Steve Mazzacane, a writer for the online news organization Branford Seven, received an alert from SeeClickFix about Bekah's call for help. Steve directly called the Branford Fire Chief, who was nearby. The Fire Chief later posted: "We became aware of it and we were out on another medical call with the payloader so the timing was perfect." Thanks to connected neighbors, Kate and Steve, and a responsive Fire Chief in Branford, Bekah was able to deliver her baby safely in the hospital. You guys are awesome! What began as love thy neighborhood quickly turned into love thy neighbor this weekend. In the wake of one of the most devastating blizzards the region has faced, a collaborative effort made between Neighbors for Neighbors and SeeClickFix helped spread relief to snowed-in citizens. While monitoring SeeClickFix activity throughout the course of Nemo I saw a range of storm related issues posted by concerned citizens. These issues seemed typical of such a storm, with posts regarding roads needing plowing, sidewalk access, and snow removal in general. What wasn’t typical about this was the overwhelming response of shovel-ready neighbors, already waiting to aid those unable to leave their house or clear a way for their car. “It’s great to shovel together”, said Neighbors for Neighbors founder Joseph Porcelli, referring to the 27 residents that were personally helped in Massachusetts alone during Nemo. One by one, as new posts streamed in from concerned citizens, Joseph Porcelli and his crew were proactively scanning SeeClickFix and making calls to ensure that help was on its way and that their neighbors were in good hands. Joseph has since received teary thank you's from people all over MA for the kindness shown in Neighbor for Neighbor's personal response and aid. What I took way from Nemo was that snow plows can’t be everywhere at once, but if you have enough caring neighbors, help can. Listen and read more about this @ NPR Boston. We have closed the SeeClickFix office tomorrow so that our team can focus on issues on the site related only to the storm effecting our community as well as helping out with shoveling and other forms of assistance in our own neighborhood. The site of course will be live and we will be on call for any urgent needs. Partners and clients should feel free to call my cell phone at 203.415.6878 if you are having trouble reaching any of us. You guys have been awesome this weekend responding to each other's concerns and you inspire us to keep up the hard work. Thanks to all of the cities that are putting in so much hard work and overtime with limited resources during the storm. Last night I did a triage tour of New Haven in a City emergency vehicle with Rob Smuts, City Official in charge of New Haven during the blizzard. New Haven has had the most snow of any area affected by the blizzard. 3’+. 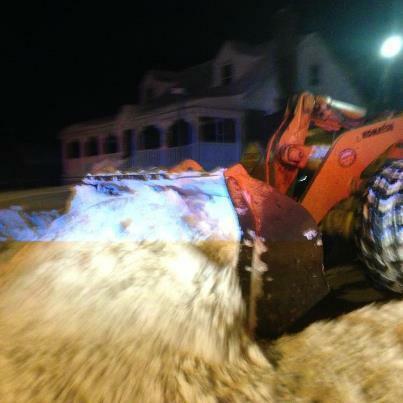 We went out looking at how the plows were doing and if any flooding had occurred yet at some of the low lying areas. We did not expect to find the City so incapacitated. The first vehicle we found stuck was an ambulance responding to a call. 10 minutes later we found ourselves pushing out a police car responding to a call. Behind the police car was a sand and plow truck that had become stuck. We would have needed Corey Booker to push that one out. 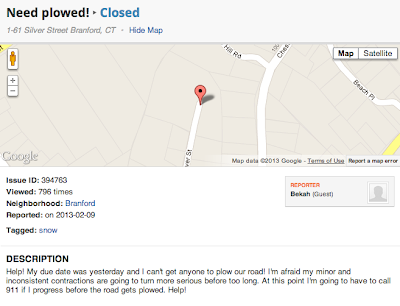 Similar stories of stuck plows have been circulating all over the east coast. At the emergency operations center in New Haven the City was using Veoci, an emergency management software founded in New Haven for responding to disasters and on the outside citizens were using SeeClickFix.com, also founded in New Haven, to report problems in. At one point last night ambulances were ordered off the road and it became very evident that as citizens we are as reliant on each other speaking up as we are on each other helping out. In Boston Joseph Porcelli at Neighbors for Neighbors had the wise idea of using SeeClickFix to encourage neighbors to sign-up to lend a hand shoveling and to ask for help. Most folks use SeeClickFix to ask for help from their City but in more and more cases neighbors are helping to solve those problems on their own. As a result, right now in the Northeast neighbors are shoveling out other neighbors in need. Elderly folks and those with disabilities have already been paired with shovelers. The peer-to-peer network on SeeClickFix that has been created out of a desire to create better citizen to government communication is optimizing and expanding on the neighborly need for, and instinct to, help. Just a few minutes ago an NYPD Officer posted a request for neighbors to help shovel him out in Holbrook, NY (http://seeclickfix.com/issues/394437-nypd-officer-needs-help-shoveling-out). In the Jamaica Plain neighborhood of Boston folks have already organized to help get a disabled woman’s vehicle shoveled out (http://seeclickfix.com/issues/391411-please-shovel-my-car). Together with Neighbors for Neighbors and SeeClickFix users, we are encouraging citizens to help shovel their neighbors out and lend a hand where they need assistance. The city’s phone lines are also likely overburdened with calls, so if its not an emergency, neighbors can use SeeClickFix to report downed trees, street flooding, power outages, unshoveled streets and other problems that need to be documented but may have to wait for a few days. Thousands of clean-up requests and calls for assistance were issued in the Northeast in the days that followed Hurricane Sandy. We hope that this storm is not nearly as devastating, but we are confident that even more neighbors will now be connected to help out. A lot of great progress has been made in citizens to government participation, and SeeClickFix is proud to be facilitating this service. As we look to future, with budgets shrinking, demand for service rising, and mother nature throwing Sandy’s and Nemo’s at us, we are going to forced to get creative on how we address these challenges. Empowering citizens to help each other and solve more of the own problems increases net capacity, efficiency, and value for all involved. Neighbors looking for assistance can use the SeeClickFix iPhone and Android apps as well as http://www.SeeClickFix.com or the NeighborsforNeighbors SnowCrew page. My father Jeremy passed of a heart attack this Summer. He 'went out like a bolt' as he had always said he wanted to go. Telling of the way he lived his life he passed just minutes after mowing his and a neighbor's lawn. I've been thinking about him a lot today. In reflecting on him and missing him (on a snow day when he would have built me an igloo as an eight year old boy before helping to shovel neighbor's out) I realize that the way he passed represents everything good that I like in people. My father bent over backwards to help a neighbor out for even the smallest thing. When he live in Westville with my mom and when he lived alone on the water in Branford, CT. Whenever there was a neighborhood issue he was there to help. During Hurricane Irene he brought sump pumps and back-up generators from his shop to rescue his neighbors' homes from flooding. His neighbors describe the scene of him quickly moving from home to home assisting neighbors and giving direction to other panicked neighbors. He led my cubscouts troop when I was a kid and my sister's t-ball team. My father had a way of deeply and passionately attaching himself to the community where he put down roots. He was always to help and he was always there for a conversation because that's what made him happy. I've been watching folks throughout the largest blizzard I've ever seen lend a hand to each other and it continues to touch me. I've never quite been able to pin down the root of my passion for what we do at SeeClickFix but today it is clear to me. I may joke that it was too much Mr Roger's neighborhood that made me the way me the way I am but it would be a lie. It was dad and I there could never be too much of that. I'm going to help some folks out today for my dad. You should too. Blizzard Prep: Help Yourself, Help Your Neighbor, Help Your Neighborhood! 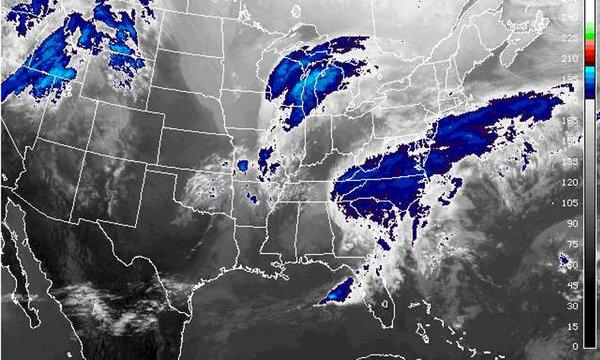 Communities across the Northeast are bracing for potentially historic Winter Storm Nemo, a blizzard predicted to dump up to 2 feet of snow in Boston and up to 10 inches in New York City. Current models predict this could match the New England blizzard of 1978. Yikes! With respect to the "be prepared" motto, we'd be remiss not to remind our users how SeeClickFix is being used to mitigate some of the effects, and improve the quality of life, in affected communities. The power of decentralized peer networks is well documented, and SeeClickFix has figured prominently in the movement towards crowdsourced community data. 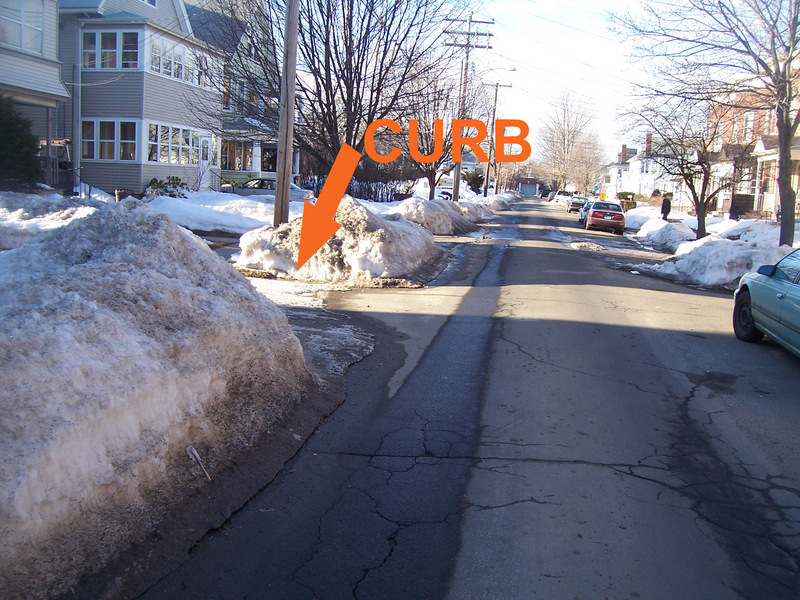 In the aftermath of a snow storm, local governments have used SeeClickFix to identify locations of large snowbanks that need to be cleared. In similar fashion, publishers have used our web and mobile platform to identify locations of inaccessible newspaper boxes, blocked by snow and ice. One user described SeeClickFix as the ultimate snow storm tool, as it allows citizens to report the exact GPS location of unplowed roads and public spaces. As a result, local governments can be more efficient in their response, allocating plowing resources with crowdsourced data at hand. In fact, we are already hearing today from client cities who are preparing to use our CRM dashboard to monitor incoming storm-related requests from their residents, commuters, business owners, and visitors. These cities and towns proactively use our civic mobile app platform as their official "311" service, encouraging residents to use our platform to communicate important non-emergency issues to them. But we're aware that many of our loyal users live in communities that haven't yet boarded the #OpenGov train. So as not to put a financial hurdle in the way of potential quality of life improvements, we're waiving all license fees for any local government that wants to take advantage of our government dashboard, to aide their response during and after this storm. Contact us if you're interested. In parallel to official government adoption, SeeClickFix serves as an important tool for keeping citizens connected with each other. On a daily basis, users post issues that are not requests or complaints addressed to their local government, but rather, ideas, calls to action, or requests for assistance addressed to their neighbors. In the case of this pending snowstorm, SeeClickFix is already being used to connect neighbors who need shoveling assistance, in particular the elderly, with neighbors who want to volunteer their labor. Journalist Erica Schlaikjer from EMBARQ used SeeClickFix to mobilize "snow helpers" in Washington D.C., to clear sidewalks & bus stops. Today, Boston web community Neighbors For Neighbors has organized a volunteer network of shovelers helping elderly & disabled neighbors get out from under the snow, powered by a SeeClickFix mapping & reporting widget. You can follow the latest requests for assistance at #SnowCrew on Twitter. You can use the map widget below to make requests for storm-related assistance from neighbors, as well as to find people near you who are in need. Media outlets, please reach out if you want to embed a custom storm-related map on your website, geographically zoomed and centered on your exact distribution area.